How would you share a bag of Skittles with your friends? How many ways can you solve 5x50? ﻿﻿SOLVE﻿ word problems using multiplication and division within a 100. 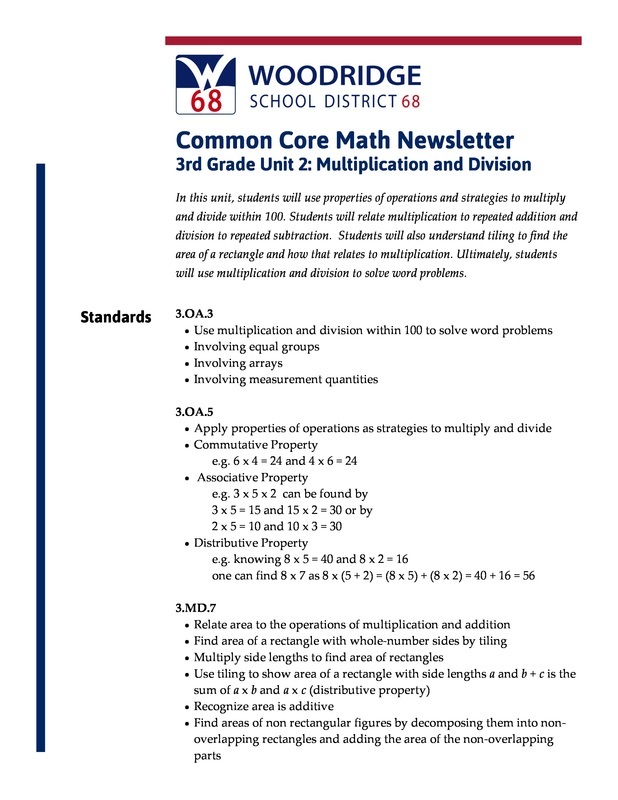 UNDERSTAND the relationship between addition & multiplication and multiplication & division. MULTIPLY 1-digit numbers by multiples of 10. 3.OA.B.3 Use multiplication and division within 100 to solve word problems in situations involving equal groups, arrays, and measurement quantities, e.g., by using drawings and equations with a symbol for the unknown number to represent the problem. 3.OA.B.5 Apply properties of operations as strategies to multiply and divide.2 Examples: If 6 × 4 = 24 is known, then 4 × 6 = 24 is also known. (Commutative property of multiplication.) 3 × 5 × 2 can be found by 3 × 5 = 15, then 15 × 2 = 30, or by 5 × 2 = 10, then 3 × 10 = 30. (Associative property of multiplication.) Knowing that 8 × 5 = 40 and 8 × 2 = 16, one can find 8 × 7 as 8 × (5 + 2) = (8 × 5) + (8 × 2) = 40 + 16 = 56. (Distributive property). 3.M﻿D﻿.C.7 Relate area to the operations of multiplication and addition. I can tell time to the nearest minute. I can write time to the nearest minute. I can solve problems concerning elapsed time. I can relate multiplication to repeated addition. I can illustrate multiplication by thinking about groups of objects. I can find patterns in addition tables and multiplication tables and explain them using what I know about how numbers work. I can relate division to repeated subtraction. I can relate division to "dealing out". I can relate division to multiplication. I can illustrate division with drawings or diagrams by thinking of groups of objects or number of objects in a group. I can find the answer to a division problem by thinking of the missing factor in a multiplication problem. I can explain the distributive property of multiplication and can use it to help solve a multiplication problem. I can explain the associative property of multiplication and can use it to help solve a multiplication problem. I can explain the commutative property of multiplication and can use it to help solve a multiplication problem. I can explain the distributive property of division and use it to help solve a division problem. I can explain why the commutative and associative properties do not work with division and can not be used to solve division problems. I can quickly and easily multiply any one-digit number by 10. I can multiply any one-digit number by a multiple of 10. I can distinguish area as an attribute of a plane figure. I can identify a unit square as being a square with side lengths of one unit. I can calculate the area of a rectangle using tiling of unit squares. I can solve real world area problems using tiling. I can relate my knowledge of arrays to tiling the areas of a quadrilateral. I can calculate the side length of a rectangle using unit squares. I can calculate the area of a rectangle when given the side lengths. I can show that finding the area of a rectangle by multiplying one side by the addends of the other side separately is the same as multiplying the one side by the sum of the addends of that other side. I can use the distributive property as a strategy to calculate area of large rectangles. I can identify real world situations that require multiplication. I can represent with drawings and/or diagrams real world situations involving multiplication. I can use multiplication strategies and properties to solve real world situations. I can identify real world situations that require division. I can represent with drawings and/or diagrams real world situations involving division. I can use division strategies and properties to solve real world situations.